Mathematics and engineering are inevitably interrelated, and this interaction will steadily increase as the use of mathematical modelling grows. Although mathematicians and engineers often misunderstand one another, their basic approach is quite similar, as is the historical development of their respective disciplines. 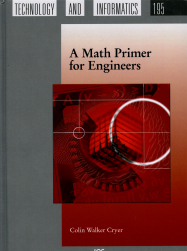 The purpose of this Math Primer is to provide a brief introduction to those parts of mathematics which are, or could be, useful in engineering, especially bioengineering. The aim is to summarize the ideas covered in each subject area without going into exhaustive detail. Formulas and equations have not been avoided, but every effort has been made to keep them simple in the hope of persuading readers that they are not only useful but also accessible. The wide range of topics covered includes introductory material such as numbers and sequences, geometry in two and three dimensions, linear algebra, and the calculus. Building on these foundations, linear spaces, tensor analysis and Fourier analysis are introduced. All these concepts are used to solve problems for ordinary and partial differential equations. Illustrative applications are taken from a variety of engineering disciplines, and the choice of a suitable model is considered from the point of view of both the mathematician and the engineer.